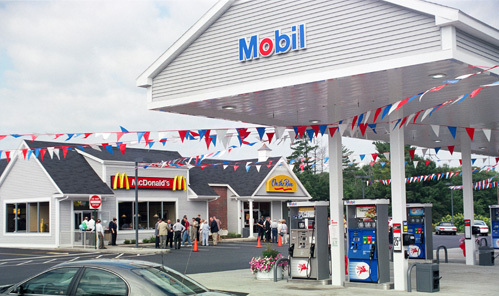 The owners of a small country store with one petroleum pump located on a small parcel of land just off busy Route I-93 had the opportunity to expand their business. The new 7,275-square-foot building includes a 60-seat McDonald’s restaurant and an eight-seat pizza shop. The 3,600-square-foot convenience store and five-island service station is open 24 hours, increasing foot traffic to 1,200 customers per day. By installing a Clivus waste treatment system with foam-flush toilets, the owners reduced wastewater flows by thousands of gallons per day, drastically reduced the total suspended solids (TSS) that would otherwise go to the septic system, and greatly improved wastewater quality. By discharging a higher quality effluent, the environment is protected, and the life of the new septic system is extended for years to come.